Joanna Ezekiel grew up in Kent and Essex, and currently lives in York. She is a creative writing tutor for the Open University and the Open College of the Arts. Joanna’s first collection Centuries of Skin (Ragged Raven Press, 2010) follows her pamphlets Safe Passage (White Leaf Press, 2007) and A Braid of Words (Poetry Monthly Press, 2003). She has an MA in Creative Writing and Personal Development from Sussex University. 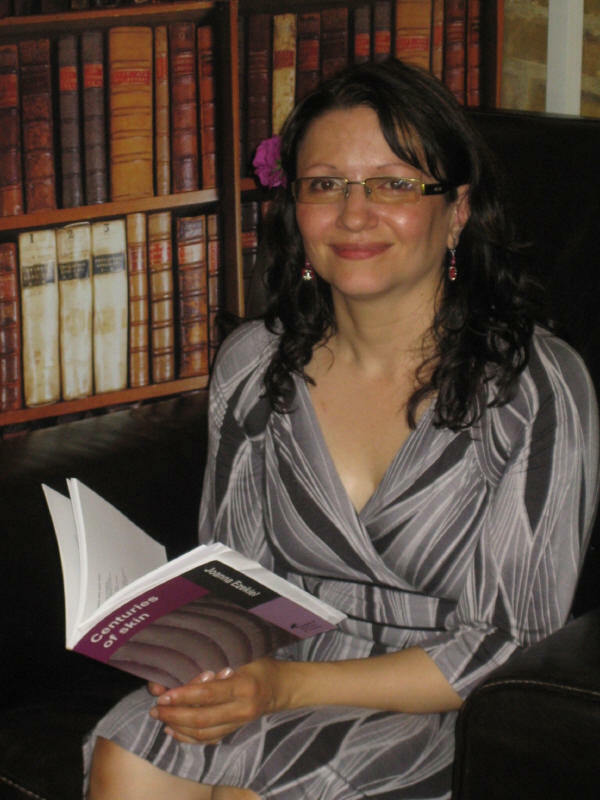 Joanna has been guest reader at events such as Coffee-House Poetry and the Essex Poetry Festival, and is available for readings. She blogs at http://mydelayedreactions.blogspot.com. Centuries of Skin was published in April 2010 by Ragged Raven Press. The collection is available for £7 including p&p from Ragged Raven Press. place it upon the dining table. her apron scarlet and green. the holiday smell of lacquer. She does not open up. turned out towards the world. smile after smile after smile. where we thought all the action happened. where his broad shadow will always win. blinking from page to page. ‘Coffee with an ex’ was longlisted for the 2009 Bridport Prize. the train a couple of stops to the beach. It’s a windy afternoon. Waves roll in. I spot gulls and persistent autumn swimmers. I hold my hard-backed notebook, its square, plain pages. students sitting at a square of tables. like a coral reef sea. at the Donmar Warehouse, London, 2009.
while the polar caps melt. Read more of Joanna’s poems at poetry pf. This entry was posted in books, poetry and tagged Joanna Ezekiel poems, Joanna Ezekiel poet, Joanna Ezekiel's After the snow, Joanna Ezekiel's Centuries of Skin, Joanna Ezekiel's Coffee with an ex, Joanna Ezekiel's Forty minutes to London, Joanna Ezekiel's Sightline, Joanna Ezekiel's Smile, Joanna Ezekiel's Writing about the sea, Ragged Raven Press on 03/09/2010 by peony moon. Michelle, it is a pleasure to read poems written with the direct approach. I like them. I understand them. They take me somewhere. Some, as ‘Coffee with an ex’ and ‘After the snow’ end with a delightful thought-provoking twist.